This is our Rose Scented Geranium Steam Distilled Essential Oil. Herbal Folk Traditional uses for Rose Scented Geranium include dysentery, hemorrhoids, inflammation, metrorrhagia, diarrhea and peptic ulcer. When my son was about 2 we had been stuck indoors for weeks due to constant rainstorms. When we finally got a reprieve, we went outside where most of the yard was still very soggy except for about 10 feet around the house. My son quickly found a grass mound to play in only to find out fire ants had made it their haven in the storm. He began screaming and I turned to pick him up and run to the back yard, removed his pants down to his diaper and then hosed him off. In only about 15 seconds he had gotten bit so much his legs were completely swollen from the knees down. Once I hosed him off, I ran in the house to get geranium essential oil to put on his legs. He didn't cry anymore within minutes after I applied the geranium to his legs. It took about 2 hours for all the swelling to go down. I was able to count the fire ant bites and stopped at 100! To this day he doesn't let a fire ant get away without smashing it and almost never gets bit anymore. Once we saw the overwhelming positive results with the geranium, we began using it before hand as a general bug repellent and if we do get bit it is the oil we apply. It removes the sting for us within seconds and takes down the swelling from the poison so fast! Rose Scented Geranium is known for use as a fragrance component in soap, lotions and perfumes as well as for aromatherapy use. It has a floral penetrating lemony-rose scent. Rose Scented Geranium blends well with Angelica, Basil, Bergamot and other citrus oils, Carrot Seed, Cedarwood, Citronella, Clary Sage, Clove, Grapefruit, Jasmine, Juniper, Laurel Leaf, Lavender, Lime, Neroli, Oakmoss, Orange, Patchouli, Petitgrain, Rose, Rosemary and Sandalwood. Rose Scented Geranium is beneficial against anxiety, driving spirit, fear, irritability, relaxing the body, relieving tension and restlessness. Therefore it is great for building willpower. Rose Scented Geranium Essential Oil is used mostly for aromatherapy and natural perfumery. 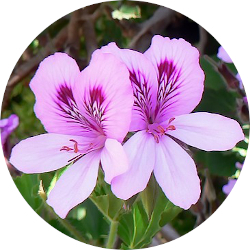 Geranium Essential Oil has the following actions: antidepressant, anti-hemorrahgic, anti-inflammatory, antiseptic, astringent, cicatrizant, deodorant, diuretic, fungicidal, hemostatic, stimulant (adrenal cortex), styptic, tonic, vermifuge and vulnerary.